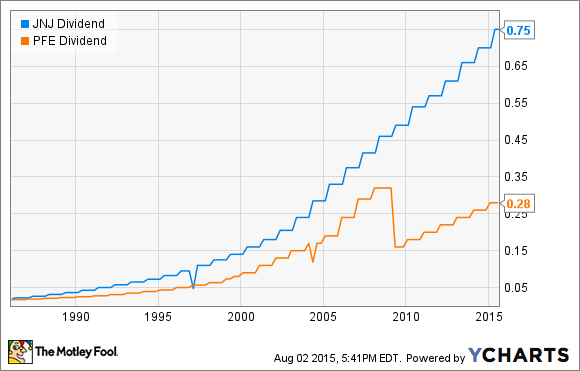 Better Dividend Stock: Johnson & Johnson vs. Pfizer Inc. Which of these two giant drugmakers is the best pick for dividend investors? If you're looking for juicy dividends, several big pharmaceutical companies offer some attractive options. The biggest of the bunch in terms of market cap, Johnson & Johnson (NYSE: JNJ), claims a solid dividend yield of 3%. Pfizer (NYSE: PFE), the second-largest U.S.-based drugmaker and third-largest in the world, boasts an even higher dividend yield of 3.3%. 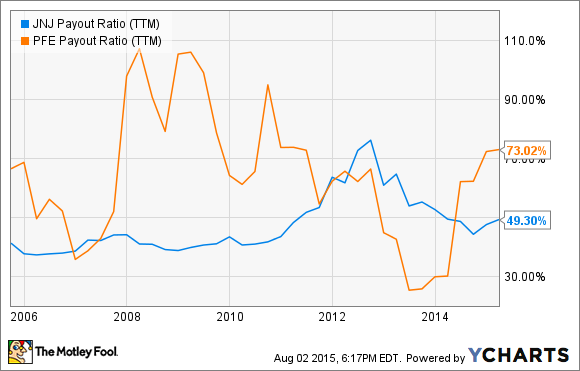 But which is actually the better dividend stock? Here's how they stack up. When it comes to evaluating dividend stocks, consistency is critical. On this score, the track records for both J&J and Pfizer look good, but J&J clearly takes the prize. Pfizer slashed its dividend payout back in 2009 during the global financial crisis. While the company's dividend has grown since then, Pfizer's dividend still isn't back up to pre-crisis levels. Meanwhile, J&J has steadily increased its dividend payout for 52 years in a row. 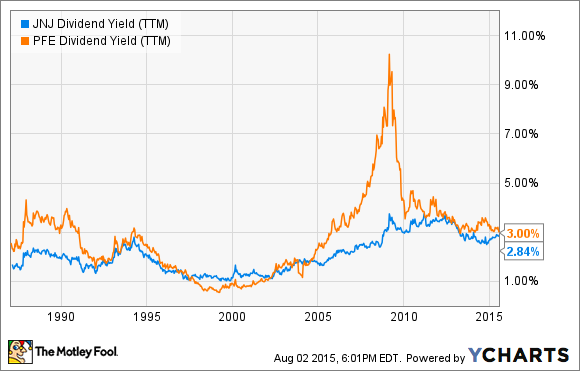 On the other hand, looking at historical dividend yield tells a different story. For much of the past few decades, Pfizer laid claim to a higher yield than J&J. Remember, though, that dividend yield is a fraction -- dividend divided by stock price. Pfizer's high yield reflected a weaker underlying stock price than J&J's. You've probably noticed those little disclaimers that state something along the lines of "past performance is no guarantee of future results." Those disclaimers are true. While it's great to have a strong dividend history, that doesn't mean that the future will be just as strong. There is a financial metric that can help investors determine if a dividend might be in danger, though. The dividend payout ratio measures the percentage of net income that a stock pays out in dividends. The higher this ratio, the more potential that the company won't be able to sustain its dividend levels. J&J's payout ratio currently stands around 50%. That's not bad. The good news for J&J shareholders is that the ratio has declined over the past couple of years. Pfizer's picture, though, doesn't look as appealing. The company's payout ratio of 73% is significantly higher than J&J's -- and it has worsened recently. Should Pfizer shareholders be worried about the company's dividend? Probably not, at least at this point. However, if Pfizer's payout ratio hits above 90% for several months (as it did back in 2008 and 2009), a dividend cut could be in the cards. Over the long run, the health of a company's dividend will usually reflect the health of the company's business itself. A company that can sustain earnings growth can continue to pay out more and more dividends. How does Johnson & Johnson's business look? Investors might not take much comfort in the company's latest quarterly results. Sales for the second quarter decreased nearly 9% year over year, while adjusted net earnings fell more than 6% compared to the same quarter in the prior year. However, things aren't really as bad as they might seem for J&J. Those year-over-year comparisons are negatively affected by divestitures and currency fluctuations. The company's revenue and earnings would reflect single-digit growth without these factors. And while sales for hepatitis C drug Olysio/Sovriad have plummeted in the face of newer rivals, most of J&J's other drugs are performing quite well -- especially Concerta, Imbruvica, and Invokana. Like J&J, Pfizer reported revenue and earnings declines compared to the same period in 2014. Currency headwinds were a challenge. Pfizer also faces decreasing sales from Celebrex and Zyvox due to loss of patent exclusivity. Some things are looking up for the big drugmaker, though. Pfizer raised its guidance for 2015 full-year revenue and earnings mid-points. It has at least a few bright spots in its portfolio with Prevnar, Ibrance, and Xeljanz. On an operational basis, the company is growing overall sales -- albeit slowly. Pfizer isn't a bad pick for dividend-seeking investors. Its dividend yield is attractive, and it seems to be turning the corner after falling off the patent cliff in recent years. However, it's probably no surprise that Johnson & Johnson gets the nod as the better dividend stock. The company has an impressive track record of increasing dividends, a respectable payout ratio, and a solid lineup of products that should propel continued growth.